A delicious Biscuit Egg Casserole recipe filled with biscuits, cheese, eggs and sausage, and takes only minutes to throw together! 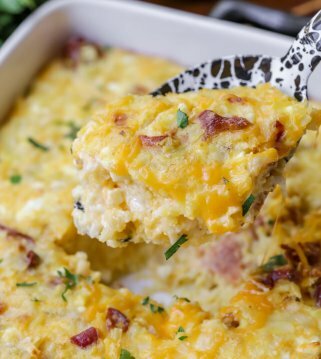 This breakfast egg casserole is a family favorite for weekends and holidays! We have become slightly obsessed with breakfast casseroles at our home. We’ve always been huge fans of breakfast foods and often have them for dinner, which means we enjoy them ALL THE TIME. They now have become as classic as Biscuits and Gravy and Buttermilk Pancakes in our home!! 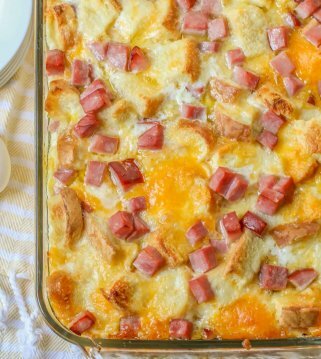 What I like most about breakfast casseroles is they are delicious, usually take minutes to put together, and are easy to change up with different meats (ham, sausage, bacon) and cheeses, like today’s recipe for a Biscuit Egg Casserole. 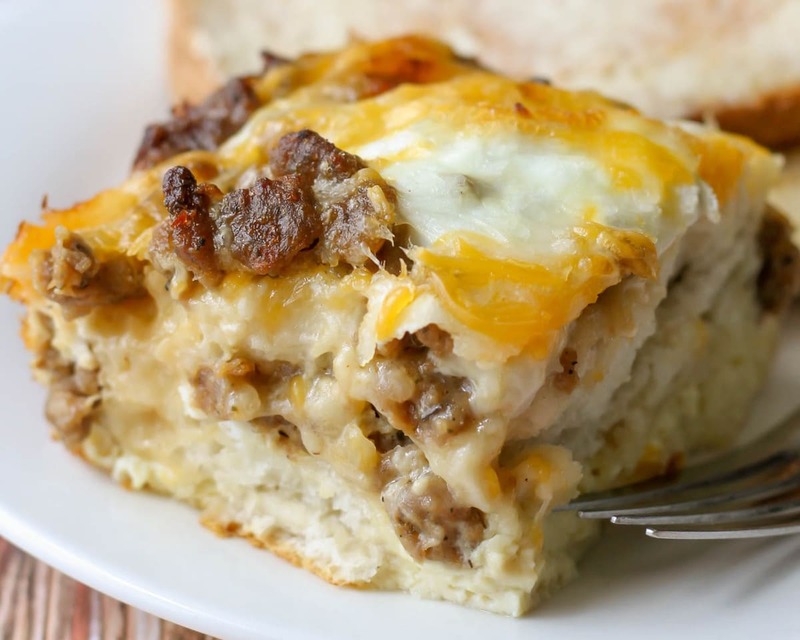 This easy breakfast casserole has been one we’ve made a few Saturdays this summer. My husband LOVES biscuits so I knew he’d like this breakfast casserole with biscuits. We love the sausage with it best but it would be great with ham chunks or bacon too. 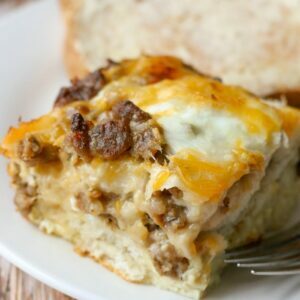 If you are like us, and enjoy a great breakfast casserole, then you should definitely give this a try. A lot of breakfast casserole require you to assemble the casserole and refrigerate it overnight before baking. This sausage and egg casserole, however, doesn’t have to refrigerate at all! You can throw it together from scratch in 5-10 minutes, pop it straight into the oven, and enjoy it 30 minutes later! Line bottom of greased 9×13 inch baking dish with biscuit dough, firmly pressing to seal. Sprinkle with your choice of meat (we prefer sausage) and cheese. Whisk together eggs, milks, salt, and pepper in a medium bowl until blended, then pour the egg mixture over the sausage and cheese. Bake at 425° for 25-30 minutes or until set. Oven temperatures can vary – Make sure to bake the casserole for a little more or less time depending on your oven. All oven temperatures may vary. I like to check my oven temperature with an oven thermometer just to be sure. You don’t want the casserole to be runny or to dry out so adjust cooking time as needed. When you think it’s done, stick a knife into the middle and see how soft it is. This will help to make sure it’s cooked to your liking. Can egg casserole be made ahead of time? If you’re wanting to make this recipe ahead of time, it’s super easy! Instead of throwing it in the oven to bake, cover it with foil and refrigerate it until you’re ready to make it in the morning. How to freeze biscuit egg casserole? If you happen to have any egg casserole left over you can keep it frozen in the freeze for up to 2 months. Keep it frozen in a freezer-safe container. When you’re ready to eat it, reheat individual servings in the microwave. You can also freeze unbaked egg casserole up to 2 months and let it thaw in the refrigerator before you’re ready to bake it. How long can you keep egg casserole in the fridge? You can keep biscuit egg casserole in the refrigerator for 3-4 days. Cooked eggs will only last about 4 days in the refrigerator. We also enjoy making this recipe for special occasions and holidays. It’s always a hit and is one we’ve made on Christmas morning many times! A delicious Biscuit Egg Casserole recipe filled with biscuits, cheese, eggs and sausage, and takes only minutes to throw together! 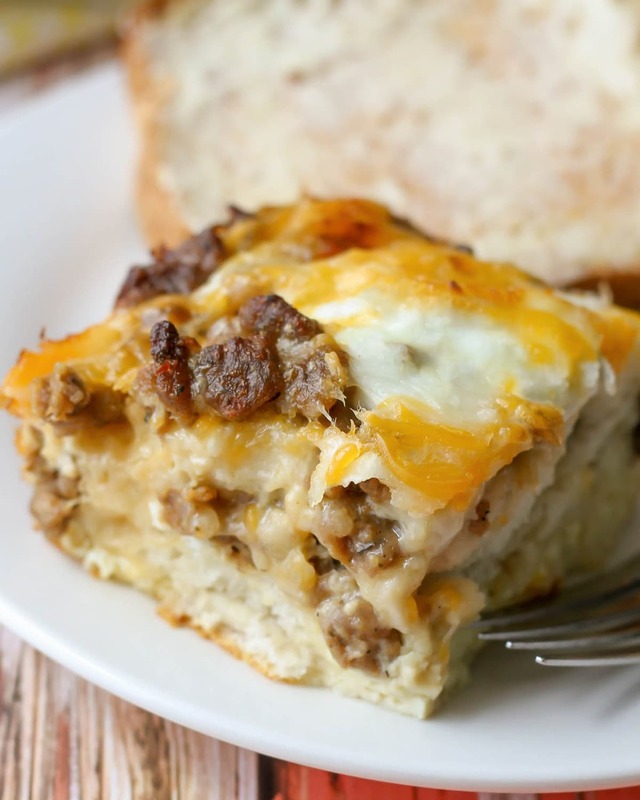 This breakfast casserole is a family favorite for weekends and holidays! Line bottom of greased 9x13 inch baking dish with biscuit dough, firmly pressing to seal. Sprinkle with sausage and cheese. Whisk together eggs, milk, salt and pepper in a medium bowl until blended; pour over sausage and cheese. Bake 25-30 minutes or until set. Let stand for 5 minutes before cutting into squares; serve warm. Recipe adapted from Just a Pinch. Delicious!! Great, easy breakfast! Thanks for the recipe!! You’ll love this – it’s so delicious!! looks delicious – thanks for sharing! Was I supposed to cover this? I do have a crazy electric oven but in 23 minutes the top was burned and the biscuits and eggs not cooked. Maybe because its convection? I have not really experienced this before. I’ve never had to cover it. Not sure what happened. What size of pan did you use? I have had similar experiences using the convection setting on my oven. I always move the rack down and reduce time or temp accordingly. Unless you set the oven to convection, it should not have been cooking on convection–unless that’s the only way it cooks which would be unusual. 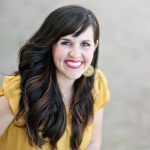 This post is over two years old, but I hope that you or others with similar problems will see this. I have been the only cook in my family for over 40 years, and can tell you that the new “American Made” ranges are anything but. When we moved and had to buy a new one (the one in our last home was made in about 1995) I just went to Sears and picked out a mid-price model. At about $2,000 it should have worked. It did not; bent legs, fluctuating oven temp. The next SEVEN we tried within 8 years also had major problems. The issue most of them had was horribly fluctuating oven temperatures that would start when they were about 6 months old, or just after I used the “convection” feature the first time. Every one of them arrived in a box that said “Made in Mexico” or “Made in China” even though they were supposedly made in America. I became pretty good friends with the Sears maintenance guy, who finally told me that the new ranges are made with very thin oven walls (to cut down on manufacturing and shipping costs) and that the convection feature frequently caused problems with the thermostats. I finally bought a Bosch, made in Germany, and it works wonderfully. I have talked to dozens of younger, less experienced cooks who blame their own inexperience for recipes that do not turn out right. In almost every instance, the problem can be traced back to their range. The new ones are simply horrible. If you are following the recipe, do not blame yourself. Get a cheap oven thermometer and check the oven’s temperature. The readings won’t be completely accurate, but I’ll betcha you will find that your oven has major temperature fluctuations. Like going from 350 to 500 degrees on its own. For those of you buying a new range, please pay for an extended warranty. I know this goes against what we are all taught, but it will be your only recourse when the oven goes crazy. Your other option is to buy a Bosch or other “high end” range. I can’t afford a Wolf or other really expensive stove–the Bosch was the only one I could find that was within reason. Good luck to all you newish cooks out there–or those who have had to buy a new range recently. And don’t let the manufacturers off the hook. The junk they are selling is simply criminal; don’t let them get away with it! Cathy, thank you so much for the info!! I’m the newish cook your referring to 🙂 I’ve been cooking for my family about 8 years and had a wonderful older convection oven in my first home, then when we moved and had a new one my tried and true recipes and perfect baked goods went haywire! I thought something had happened to me. Then over time realized I had to become acquainted with the new oven and learn it quirks! Its terribly sad the poor quality of new and expensive items are these days. I too had issues with this recipe. First it wouldn’t bake through, so I put it in a bit more, still not baked through and knew I needed to cover it at that point to not burn the top. But then suddenly after only a couple more minutes it was not only baked through but burnt on the bottom! I was so frustrated! And it was supposed to go to church as it was my turn to make breakfast for our Sunday school class. Good thing I’d made a cinnamon apple crumb cake the night before and I just took that. Despite the the issues it is quite tasty. I used fresh cooked sausage though, I hate anything precooked. More processing and bad stuff in it. Same for the biscuits although this particular morning I did opt for ease. Thank you again for the great info! I will definitely start checking my oven temp with a separate thermometer. I think my oven made a huge jump on me this morning! I tried the 8×8 version of this recipe. The biscuit layer at the bottom had risen way too much, to the point where all of the eggs, cheese and meat spilled over into my oven. I followed the recipe to a T, not sure where this went wrong. Very disappointing. 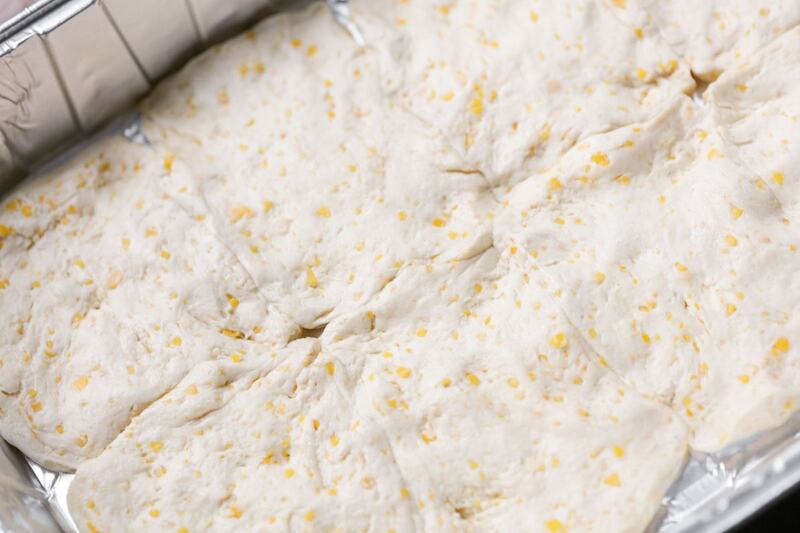 Have you ever tried making this the night before, refrigerating, and baking in the morning? I was wondering the same about making ahead/freezing? I was so sad:( I used the 8×8 and the middle of it was complete mush. The center was still completely raw and the edges were crisp. The temperature is too high. Just made this but at 375. Perfection! I made this for dinner last night and it was a great, easy option for dinner. My husband even reheated it for breakfast this morning. I used a 9X13 pan, but I had to cook this closer to 40 minutes for the middle to cook through. When I pulled it out at 25 the middle was still mush. It’s great for leftovers!! Yeah, every oven is different, so the times may be different. Thanks for sharing!! Thanks!! They are just the regular biscuits:) Hope you give it a try..they are delish!! My son is very picky and he loved this recipe! It is very easy to make. I did however feel the recipe needed more salt and just a tad bit more of pepper but that’s maybe personal preference also. Will definitely be making this again!!!!!! Yay!! So glad he liked it! Thank you for sharing!! This was a big hit for my husband and I. We made it together for date night. We did the 9×13 recipe. We decided to cook our own sausage though and it was still super yummy. What had me concerned was it did expand a ton in the oven but once I took it out after it was done cooking (about 30mins) I stabbed it with a fork and it went down eventually. I also like to keep an eye on whatever I cook because I have a tendency to burn things so that is why I was able to make sure nothing burnt and nothing got too big. After we put the leftovers in a bag and put it in the fridge. It was just as good for the next two days, even after being reheated! What a fun date!!! Thanks so much for sharing and for letting me know!! So glad it was a hit! You can 😉 They absolutely are!! Thanks so much! Do you press the biscuits flat into the pan or just set them in together? You do press them in to seal. Hope you like them!! Thanks! Overbaked a little due to comments, but made country milk gravy and it was FABULOUS! Yay!! So, glad 🙂 Thank you! This looks delicious and can’t wait to try it. I do have a question? How many does serve. And i was reading some of the comments, and some were saying it bubbled over. So I was wondering if after you flattened and sealed the biscuits if you poked them with a fork if that would keep it from bubbling over. Thanks so much for the wonderful recipes and keep them coming, Please. Have a wonderful day and God Bless. If could feed 12 with a good size square or more, if you cut them smaller 🙂 You could poke it. I never had that problem, but it could work 🙂 Hope that helps and let me know what you think 🙂 Thank you! Yay!! Thank you so much!! I am so glad you liked it! By accident. Still came out great. The biscuits could probably have been done a little more if i used the right temp but they aren’t undercooked and I figure I will just reheat in the oven anyway. My question, do you think once baked this would freeze well? It made waay more than I was expecting. Thanks! ???? I think it should be ok 🙂 I personally haven’t tried freezing it, but I don’t see why it couldn’t. This was fantastic! Only changes: 375 oven, and I cooked a pound of pork sausage before adding it (I couldn’t find the pre-cooked crumbles). Will absolutely be making again! That works well, too! I’m glad you liked it 🙂 Thank you so much for letting me know! They sure do 🙂 ENJOY! Hi. Can you make the biscuit egg sausage casserole the night before and bake in the morning? You sure could 🙂 I hope you like it! Love this! Only had flaky biscuits and not sure if thats why, but some eggs got underneath. Came out layered! Oh so yummy! Glass pan, 425*, 22 minutes. Perfection! Thank you! This will now be a regular in our home. I have made this recipe several TIMES & everyone loves it! Only thing I can figure out is why everytime the eggs ends UP as the bottom layer?! I am glad they do!! Yeah, they do & never know what makes it end up that way, but it does & we love it? Do you throw the jimmy dean sausage into reipe while it is still frozen? I got the bag that has sausage, potaties, green peppers and onions. Wasnt sure if i just throw that in frozen? Any tips to help me turn this into a freezer meal? Cook it and then freeze it? or assemble, freeze, then bake? Thanks! Hmm..good question! I haven’t tried freezing it. I would probably bake it, then freeze it. Then I would just warm it up before serving. It might work, before cooking, too. I will have to try it! I tried this as a brunch for Mother and I. We both LOVE it! Thank you so much for an easy prep, delicious meal idea. I am so glad you both liked it!! Thank you for trying it & for letting me know! I made this for dinner tonight and hubby and I both loved it! It turned out perfect. I’m wondering if you have the nutritional info…especially the calories? I have lost 30 lbs. (yay, me!) and have 50 to go. Thaks for this fabulous recipe! That is so awesome to hear!! You go girl!! Unfortunately, I do not have the nutritional info. There are sites though that can convert it 🙂 Keep it up! I added up the calories for each ingredient then divided by 10 servings and came up with approximate calories per serving. Leftovers for dinner tonight!! Any idea that the number of servings it is and the amount of carbs are per serving? I only ask because I’m diabetic and need to plan my carb intake very closely. I am sorry, I do not have the nutrition information. There are sites you can convert recipe. You can get anywhere from 12-16 servings, depending on how big you cut them. Do you think this is adaptable for the crockpot? I’m bringing it to work and want to keep it warm. Thanks! I am sure it could, though I have not tried, so I am not sure how I would exactly do it. I would need to experiment to see what works. Has anyone prepped the night before and baked the next morning? Ok I’ve made this twice. I followed the recipe to the T the first time and 425 had my kitchen smelling like burnt biscuits. The 2nd time I set the oven to 400 and everything looked good until I cut the casserole. Everything was cooked but the cheese and sausage cooked around the biscuit which left it dry like it needed syrup or something. So I will not be making again. Hi! My friend made this for me and it was so good!! I have a question, could I use homemade biscuit dough? Also would bacon work? My hand slipped an I meant to put 5 stars! Oops sorry! Definitely 🙂 I am so glad you liked it & thank you for the stars!! Glad to share! It’s perfect for a crowd. I hope they all like it. Have fun & enjoy! This was so yummy! Had the pleasure of enjoying this for breakfast, family favorite! Yay! I am glad to hear it’s a favorite!! Thank you so much! This was a quick and easy recipe. I read through the comments before making it and saw that some people had trouble with over/undercooking it. I set my timer for 20 minutes and just kept an eye on it. Mine cooked in about 28 minutes. I also made mine 1/2 sausage and 1/2 bacon. The combination was delicious! I love sausage, so I couldn’t wait to try this!! It was so easy!! I can’t wait to make it for extended family! They will love it. It was cheesy & you could also add more meat or cheese to make it to your liking. Where has this recipe been all my life? It was just as easy as could be, and the results were amaaaaazing. this recipe is a keeper. Yay!! I am glad you found it! Thank you so much for sharing that! I made this today and it is fantastic!!!!! Thanks!!! Thank you for trying it!! I am glad it was a hit! A great way to serve up breakfast when your in a Rush. Doesnt take much effort and can feed a few people. A nice alternative to biscuits and gravy. WHAT if you prebake the biscuits beforehand? Im just worried that they will be TOo soggy. I lovE how easy this recipe is. My kids love when i make it instead of serving cold cereal. I can’t believe how easy & tasty this was!! My kids gobbled it up! I love that you can add bacon, peppers, whatever you like. 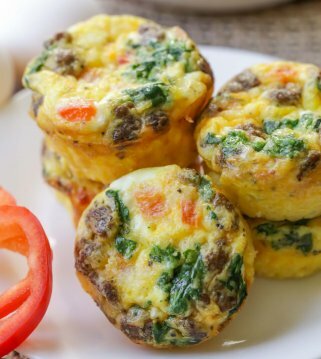 Another great recipe with all the flavors of breakfast all in one. 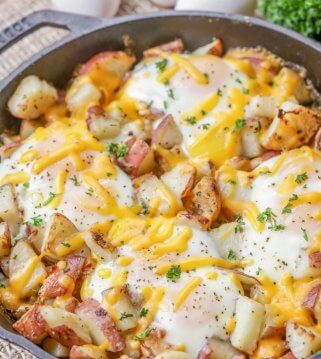 Who doesnt love the ease of breakfast in a casserole dish and you can make it ahead of time? Quick and convienent! My family LOVes Breakfast. Thanks for this Yummy recipe to add to our favorites! While I do appreciate the nutritional info, it doesn’t help much unless the number of servings is given. People’s portions can & do vary greatly. Thanks. I am sure it could, though I have never tried. I am sure it would be a hit! I looked on Pinterest for Christmas breakfast ideas and this recipe came up. It looked simple enough and Made plenty for all the family visitng. It was such a huge hit that several people asked for the recipe and have since made it themselves. I’ve made it at least twice a week since Christmas, it’s that good! The only thing i changed is that i use both sausage and bacon, because why not? And i use 9 eggs instead of 6, because agAin, why Not? Tip: when re-heating Leftovers, Cut the portion Into a couple sliCes and put a little Pat of butter in between each slice so that it is not dry. This is a simple but excellent classic breakfast casserole that i will be keeping in my meal rotation. That sounds great!! I am so glad it was a hit & thank you so much for sharing the recipe! So easy & delicious! This was perfect for when I had family visiting over Christmas – everyone asked for the recipe! The Family *loved* thIs! If you top it with syrup when serving it, its the icing on the cake. i wiLl be making a douBle batch next time. I’ll have to try! So glad your family loved it! Thank you! I made it wish diced ham and baked at 400…it was perfect! Sounds great! Thank you for trying it & for letting me know! Delicious! A hit with my whole family! Yay!! I am so glad it was! Thanks!